The development and growth taking place in the Asian continent seems to be the latest buzz on the street. The Asian economy led by India and China is chugging at the fastest growth in the world marking a crucial shift in the economic power from the west. It is but obvious that the growth in these emerging economies would look to drive the investor sentiment towards increasing optimism towards their stock market investments. This survey measures and tracks investor sentiment and behavior providing investor insight and confidence into the outlook of stock market investments. The India index has witnessed an up tick from 169 in Oct-Dec 2009 quarter to 174 in Jan-Mar 2010 quarter. The positive investor sentiment comes on the back of increase in growth optimism, expectation of lower inflation, strong domestic demand and dynamism in local stock markets conditions. Despite optimistic scenario, investor’s risk appetite remains ‘low to moderate’, according to the findings of the survey. Optimism in Southeast Asia was mixed whereas the sentiment in countries such as India and Thailand remain cautious due to political instability. 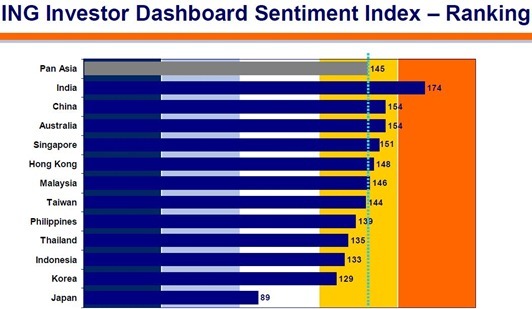 However, the overall Asia (ex-Japan) Sentiment Index remains stable at 145 for Q1-2010 as against 147 as on Q4-2009. According to the survey, 60% of the Indian investors plan to step-up their exposure to stock markets in the up-coming quarter on expectation of improvement in the economic situation going forward. Given that, a whooping 69% of the Indian investors find the high-risk investment space favorable to further deploy funds. From the trough levels witnessed during the global crisis, the Indian Benchmark Indices Nifty and Sensex have more than doubled over the last one year. Investments in Index funds have yielded over 100% returns at a scorching pace with respect to time horizon. It needs to be determined whether the indices are up for consolidation for the next couple of quarters. However, the survey has adopted a cautious stance towards China’s tightening credit and monetary policy and rising food inflation in India which could slightly dampen the investor sentiment though not by much. 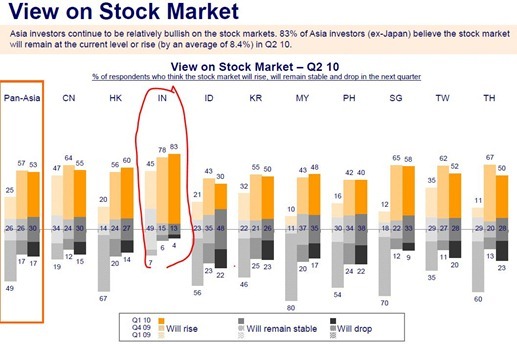 Sentiment also remains high in Hong Kong and Singapore, where 73% and 70% of investors from respective developed markets expect a rise in their local residential real estate prices in May-July 2010 quarter. Why is Indian Stock Market rising when Economy is falling? thanks for such an intresting corporate news.ur efforts r realy appreciable. Well…i too just redeemed @ its peak……….quite co-incidentally though!!! I am not really all that optimistic……….w/ the latest Goldman Sach thingy……….!!! All this shows that the Indian economy is on the right path, our governments policies have helped secure safe and stable growth, the only issue know is the high inflation. I guess I’ve just done what Warren Buffet says, I think the market has touched its high and will not go above 18K for the next one year, so I just booked profits on my mutual fund, which I feel was a right decision. Yes… I feel both of you have taken correct steps in lieu of the strong bounce back of the markets over last 1 to one and half years. To me, best step during such times would be to, instead of liquidating whole portfolio, go for a part liquidation of portfolio, say, for example, parting away with 60-70% of investments and yet stay invested with remaining portfolio in order to mitigate market related risks. Markets never tend to have unilateral upside run even during the best of the bull markets. It does give opportunity for investors to enter occassionally. Later, it depends upon investors whether they’re able to tap such opportunities or ruin them on the back of fear.